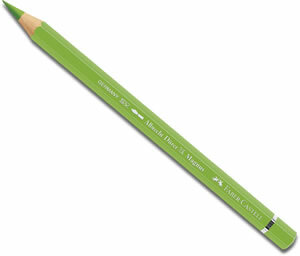 Faber Castell think that Albrecht Durer Magnus may well be the ultimate watercolour pencil and it’s easy to see why. 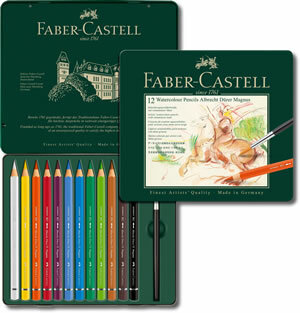 The pencils have an extra thick 5.3mm lead which leaves a soft but intense colour laydown, ideal for drawing or shading over large areas. The high quality, fully water soluble, SV bonded lead ensures unsurpassed watercolour effects and vibrancy. Finally a large barrel makes for easy and fatigue free drawing. 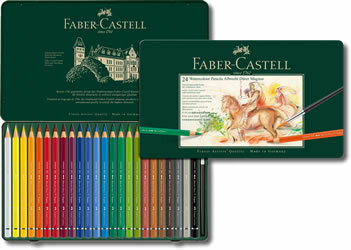 The entire range of the Albrecht Durer Magnus Pencils in a tin.